Florida manatee, Trichechus manatus latirostris, a subspecies of the West Indian manatee, endangered. January 13, 2012, a series of the documented adoption of a small female orphan manatee calf. 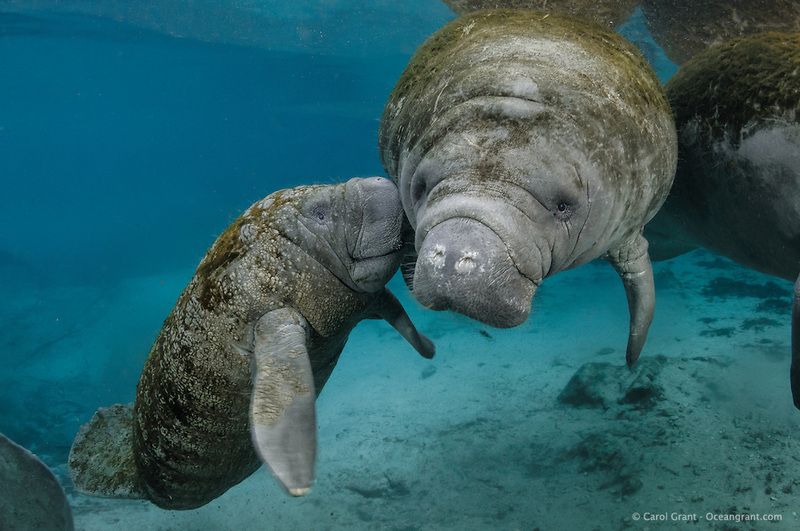 Small female orphan manatee vocalizes to the immature older calf of the potential adoptive mother. The small orphan repeatedly vocalizes loud audible squeaks presumably begging for milk. Horizontal orientation with warm blue spring water on a cold day. Three Sisters Springs, Crystal River National Wildlife Refuge, Kings Bay, Crystal River, Citrus County, Florida USA.